Hanabi, in the outskirts of Nagoya, came highly recommended. I say outskirts, but to be honest, I know almost nothing about Nagoya. What is famous here? What are the people like? Why is this city Japan's 3rd largest? I do know, though, that Nagoya gets a bad rap. My coworkers joked that in a national ranking of beautiful women, Nagoya comes in dead last. Despite often muttered shots like this, Nagoya does have one thing going for it, at least. Taiwan Ramen. Shoyu ramen with a kick. A kick of spice and a kick of vinegar. Hanabi's menu has it, somewhere on that giant page. Yeah, this shop is a repeater. Too bad I was just there for one night. What to get? When the noodle master has on a mazemen t-shirt, you order the mazemen. 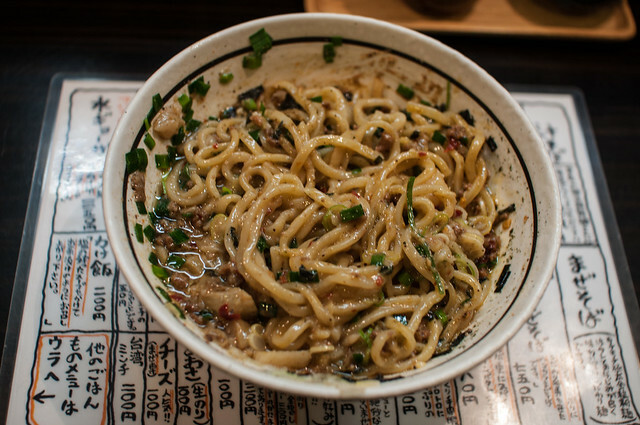 Taiwan mazemen. Like I said, I can't attest to the beauties of my human species, but this bowl is definitely gorgeous. Delicious. This ranks up with Junk Garage as one of the best maze style bowls in Japan. If you find yourself with a couple free hours in Nagoya, do yourself a favor. The downside? Yeah, there is one. A 10 minute train ride from Nagoya station. A 9 minute walk from the station. And then the line. Over 50 people were waiting on a Saturday night. I had just finished doing about eight hours of cardio workout level kid's shows (my non-ramen job! ), and wanted nothing more than a bath, a beer, and bed at the hotel. An hour and a half standing in the cold was unpleasant to say the least. Downright torture if I feel like over-exaggeration of this story. Followed by a 2500 yen taxi back to the hotel. So was it worth it? Yeah, it kind of was.